This turkey or chicken pot pie recipe is perfect for using up roast leftovers. I love roast chicken or turkey leftovers and am always looking for delicious ways to serve them. This one is a traditional favorite. Several hours before serving: Melt butter in a saucepan (medium heat). Add onion, carrots, potatoes and celery and cook until softened, about 5 to 7 minutes. Stir in flour and whisk, keeping the pot on medium heat, about 2 minutes. Add seasonings and stock, 1/2 cup at a time, stirring constantly, until it thickens, about 5 minutes. Remove bay leaf. Stir in peas and chopped turkey or chicken. Cover and set aside to cool, then refrigerate until cold. The cold filling will be quite thick. 45 minutes before serving: Preheat oven to 425°. Spoon filling into 9" pie crust shell. Place second pastry layer over top of pie and seal the edges. Make vents in the top of the pie with a knife or fork, for steam to escape. Brush top with milk. Bake 12 to 14 minutes, then reduce heat to 325° and bake 15 to 20 minutes longer or until pasty is golden brown and filling is bubbling. Want a quick gourmet chicken pot pie recipe? Replace the pie crust with sheets of phyllo pastry. Always keep phyllo pastry moist while you are working by covering it with a damp cloth. Remove the sheets individually, brush with melted butter and stack them. Cut to the desired size for a large or individual pot pies and lay the phyllo over the casserole dish. You will get light crispy layers with little fuss. Make individual pot pies and bake for a shorter period of time. If you want a chicken pot pie that is a bit lighter, omit the bottom crust and just top the filling with an upper crust. Bake until the top crust is browned and the filling is bubbling. Up the vitamin content by adding other vegetables if you like. Try kernel corn or very small pieces of blanched broccoli. Make several individual pot pies in small foil pie pans and freeze them. They make a very easy dinner on a busy night. Just thaw and heat! Don’t have leftover chicken or turkey? No problem. Just cook 2 chicken breasts or use bought rotisserie chicken. This pot pie recipe never fails to please and is especially quick and easy to prepare if you choose to use pre made pastry. 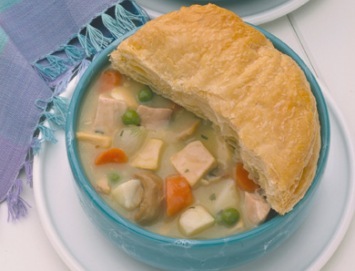 If you like our chicken pot pie recipe, have a look at our other meat recipes here. Love that there’s no thickening agent e.g. flour. Easy and delicious recipe! i don’t usually leave comments on recipes but this one deserves one, it is not only very simple to make, but it is absolutely delicious. mmm 🙂 thanks for having it up here, i will definitely be using it again. This was so good. I added a clove of garlic to the veggies and used 1 tsp. of poultry seasoning in place of the thyme and rosemary. Delicious! This looks sooooo good. Gonna try it tonight. No peas, but kernel corn should be just as yummy!!! Love love love this recipe! I changed it a little by only using half of the chicken broth, 1 tbsp of flour, and then adding 1 can of cream of potato soup, and a half cup of milk. I also added corn. It was unbelievable and even my fussy kids loved it! Simply wonderful. I tried this with my family tonight.